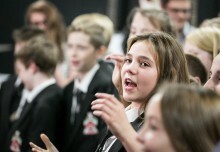 Fred Longworth High School became a Musical Futures Champion School in 2008 and is committed to ensuring that our students receive the very best musical education. All of our lessons involve students playing instruments – everything we learn, we learn through playing – this is the way we think things should be! 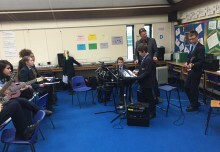 There are three music teachers at the school and we have fully embedded the ethos of Musical futures in our KS3 and KS4 curriculum. Ask our students what Musical Futures is and they wouldn’t have any idea – it’s just the way we teach in our department. 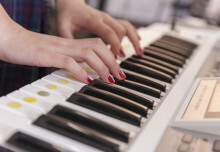 We offer three options at KS4 in order to cater for different interests amongst our students: GCSE Music, RSL Music Practitioners and NCFE Music Technology. We have a wide range of extra curricular opportunities within school including a strong Brass Band culture, which reflects our local heritage along Choir, ‘Rockskool’ and Wind band. 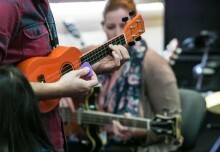 Musical Futures has played a crucial role in our development as a teachers and as a department, and has engaged a wide range of students in making music – many of which you wouldn’t traditionally expect to see around the music department!